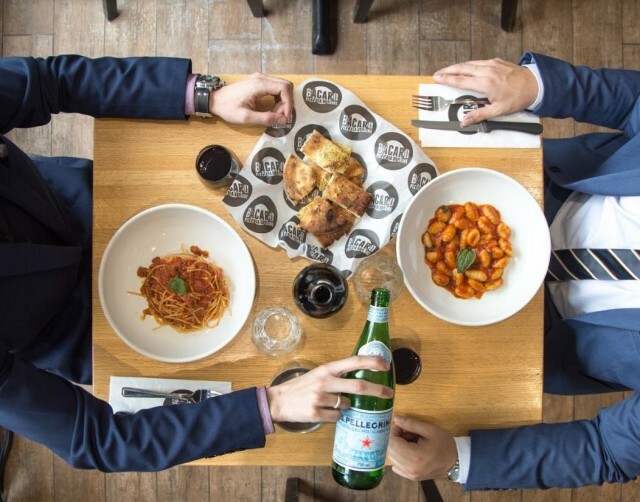 After opening their first location in Westmount a few years back, the Bacaro franchise began to grow faster than expected. 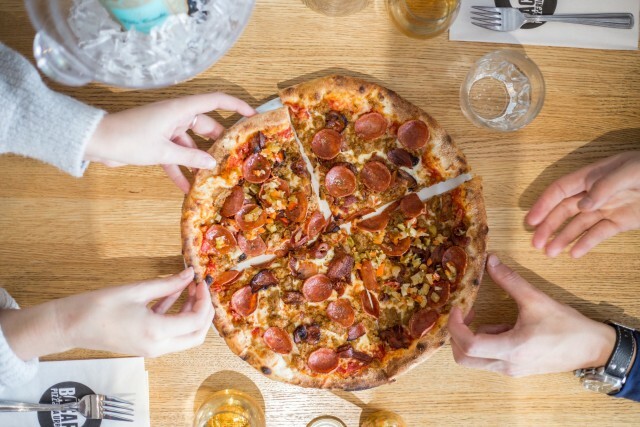 With four successful locations all over Montreal and three on the way, it is clear that the franchise has gained significant importance in Montreal. 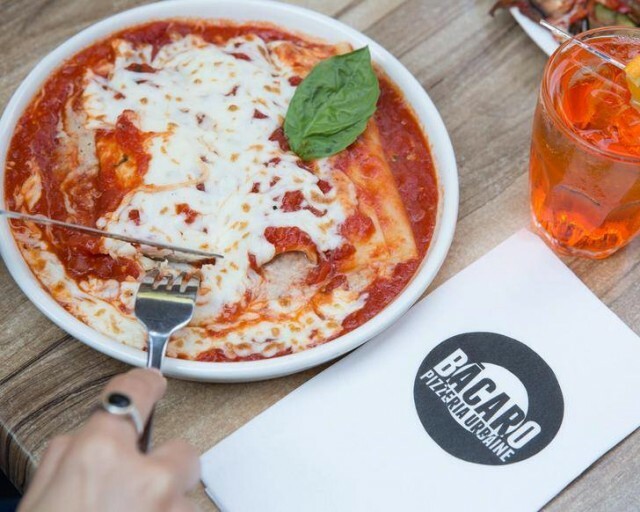 Located right in the heart of the lively NDG neighborhood, Bacaro Monkland is home to the Neapolitan “urban style” pizza. We had the pleasure of meeting one of the owners and managers, Andre Pereira, who went above and beyond our expectation with both his professionalism and hospitality. Like he does with all customers, he made us feel right at home. 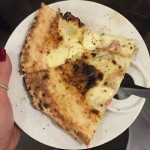 It is no surprise that “bacaro” is an Italian saying for “a restaurant serving simple food and good young wines.” The restaurant’s décor is modern rustic with brick walls giving it a cozy and comfortable feel. Logos of renowned Italian products are splashed in big along the walls, such as Aperol, illy, Nutella, San Pellegrino, and Campari to name a few. The restaurant is spacious, making it the perfect place to have dinner with your whole family or even to celebrate your birthday. Andre will surely welcome you with open arms and take good care of your group. You can even catch your favourite sporting games around the bar thanks to two flat-screen TVs on either side of the roomy bar. 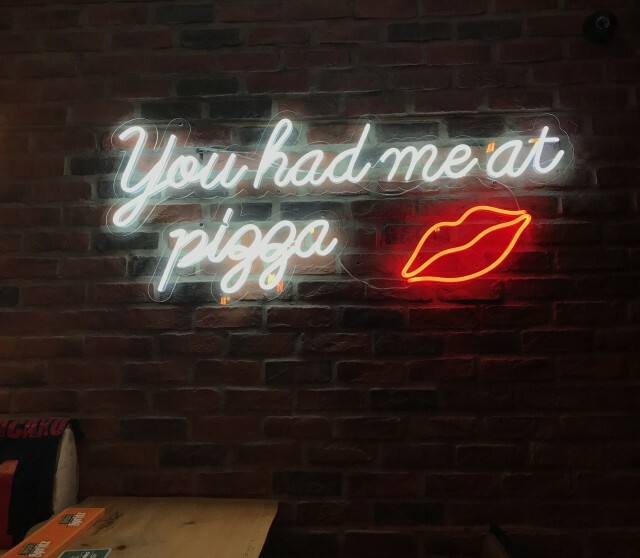 Next to the bar, you’ll find Bacaro’s famous “you had me at pizza” neon sign – very insta-worthy. 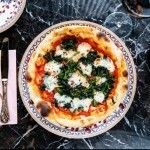 Bacaro Pizzeria uses top quality ingredients from their Italian importers to serve some of the city’s best pasta and wood oven pizza. 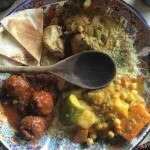 We had the chance to try a little bit of everything Bacaro has to offer. We started off with bitters, of course. 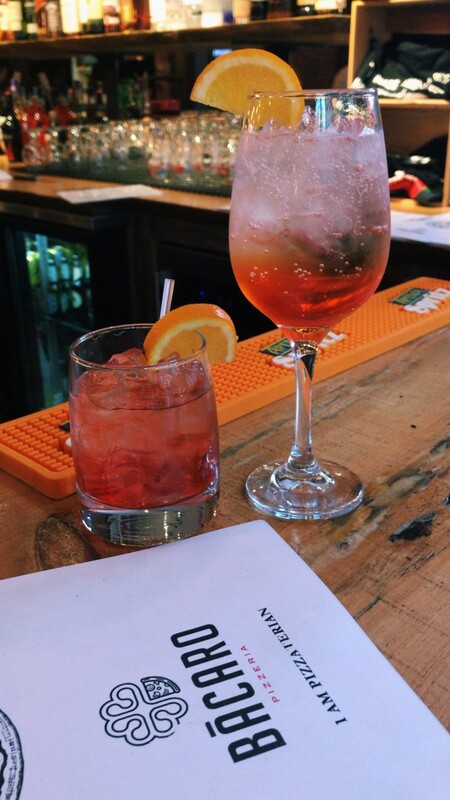 What is an Italian dinner without a Negroni and Aperol Spritz – delicious! 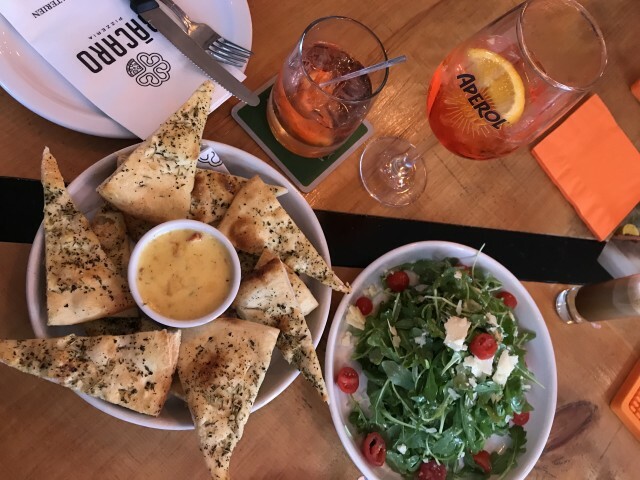 As an appetizer, we tried Bacaro’s Fonduta cheesy dip served with warm crispy focaccia along with their fresh Rucola Salad topped with shaved parmigiana cheese. When it came down to ordering pizza, all fourteen on their menu sounded amazing, so it was pretty difficult to only one choose one. We finally went with the Diavola which is topped with mozzarella and spicy salami. Of course we also had to order a plate of their fresh homemade pasta. Bacaro also has the most delicious spicy giardiniera that you can add to your pizza or pasta, and of course, their classic spicy oil to give a nice kick to your pizza. 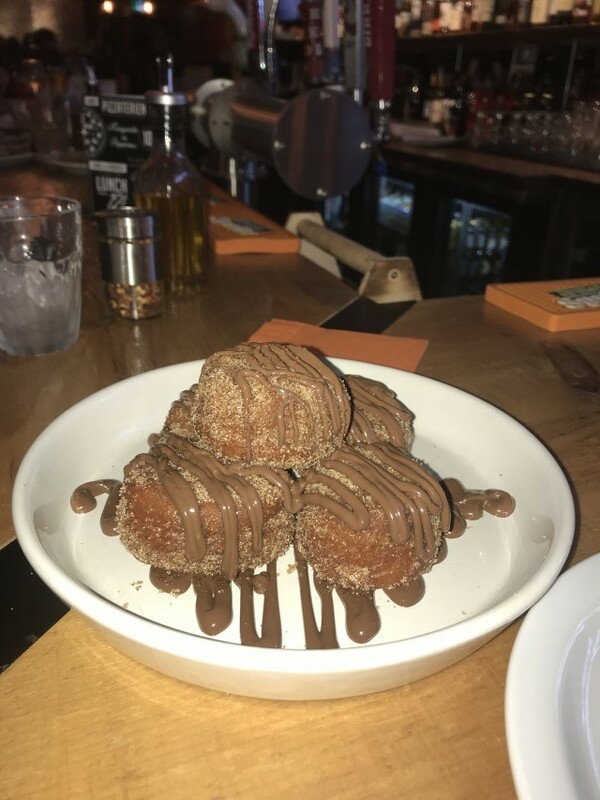 We thought we were done, but couldn’t leave without trying their famous Nutella Fritters. W-O-W. They’re deep-fried, fluffy balls of dough coated with sugar and topped with a generous amount of Nutella. A sweet end to our amazing Bacaro experience. 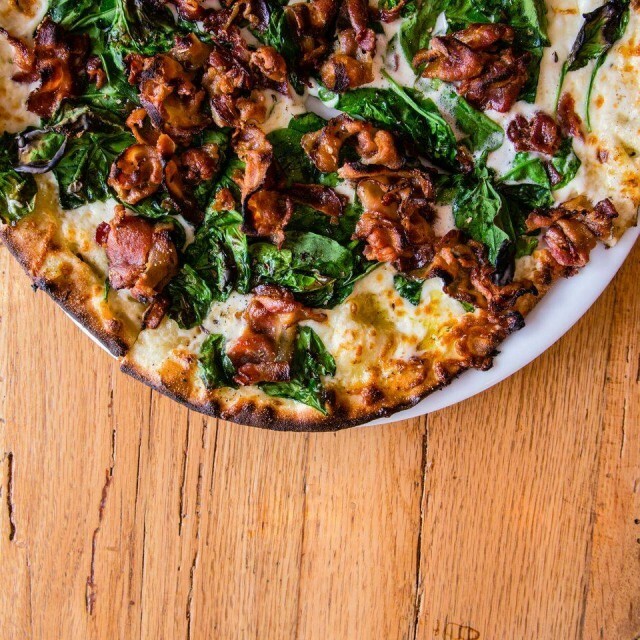 We recommend Bacaro to anyone looking for a delicious, authentic, and reasonably priced pizza joint – well worth it! 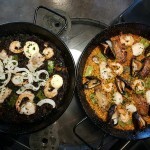 Photos by Bacaro and Natacha Guiragossian (@natachaeats).